Bring Bohemian beauty to your outfit with Stefanie Wolf's vibrant strand of Czech glass disks. 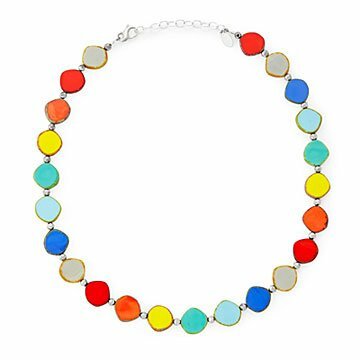 Stefanie Wolf has an eye for all kinds of glass beads, but one kind stands out for her: "Whenever I was bead shopping I noticed that the richest colors and most luscious finishes in glass beads always seemed to hail from the Czech Republic." The organic imperfections of the vibrant Czech glass beads she uses infuse her design with Bohemian beauty. Small faceted beads between the richly hued rounds lend extra sparkle, while a large lobster clasp and adjustable chain (18 to 20 inches) makes the necklace easy to wear. The cheerful strand will add a touch of modern elegance to any outfit. Handmade in Massachusetts. While pursuing a graduate degree in psychology, Stefanie Wolf found jewelry-making to be her own form of therapy. As her jewelry gained a following, Stefanie decided to take a year off to pursue her jewelry hobby, and never looked back. Her collections of elegant, vibrant, wearable jewelry have become a powerful way for her to bring joy and beauty to others. Currently a year-round resident of Martha's Vineyard, Stefanie draws inspiration from the power and beauty of the ocean, the coastal landscape, and the magic of island life. Wipe occasionally with a soft cloth to restore shine to glass beads.